Dutch Perspectives concentrates on Dutch contributions to media entertainments from 1659 through to the late 20th century. Its eclectic collection of essays covers a wide range of materials, from important original research on the visual sources of the early 18th-century Musschenbroek slides, to a unique memoir of a fairground Bioscope show and a serpentine dancer at the start of the 20th century. Further chapters document the illuminated peepshows and ‘fireworks without powder’ that were alternatives to projection; the use of the magic lantern for political and satirical commentary; and a previously unrecorded Life Model slide maker, Jacob van Staveren. 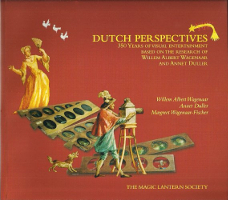 There is also a detailed record of the appearance and use of the magic lantern in books, popular prints and songs for children in the Netherlands, and the final chapter is a valuable record of some modern performers. At the centre of all these topics is the life and work of the late Willem Albert Wagenaar (1941-2011), with reprints and first publications of his essays on lanterns, slides and their use, as well as a clear impression of his own lantern shows and skills as a showman and entertainer. Materials from the collection he assembled at the Christiaan Huygens Theater are found throughout the book, which represents the completion of his dream of documenting the Dutch contribution to the history of optical media.